The community of Aughrim traces its roots back to a time when bloody hills and valleys were the scene of the battle of Aughrim, the fiercest fight ever fought in Ireland’s turbulent and bloody history. By visiting the Battle of Aughrim Interpretive Centre you can relive the scene of the fateful events the Battle of Aughrim 1691 where over 7,000 people lost their lives. An interesting landmark is a solitary whitethorn bush known as St Ruth’s Bush where St Ruth is supposed to have been killed. It is marked as a National Monument. After visiting the Interpretive Centre, a leisurely stroll through the adjoining Park, with its various displays,will help the visitor to visualise the people and events that made and shaped Aughrim’s past. The 7,000 who fell at Aughrim are commerated by 22 foot Celtic Cross close to the now in ruin O’ Kelly Castle. On the 10th January 1603- the day after the hazardous Shannon crossing – O’ Sullivan Beara’s famished and battle-weary convoy had their passage blocked at Aughrim Hill by two troops of cavalry and five companies of soldiers under the command of Captain Henry Malby. O’ Sullivan Beare’s convoy scattered at the sight of this well- organised army. However, in a remarkable battle speech, O’ Sullivan Beare rallied his troops to fight, though vastly outnumbered, Henry Malby and Richard Burke, his senior officer, were killed. Demoralised, the crown forces retreated to a nearby garrison. Despite his remarkable victory, O’Sullivan Beare and his camp, many of whom were wounded, marched 20 miles into the night to avoid further attacks from surrounding garrisons. The 97km route was, in the main, funded by Galway Rural Development. 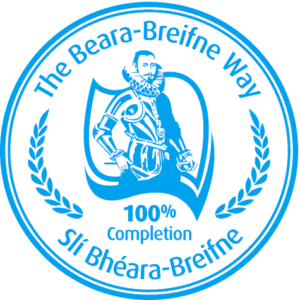 Aughrim is part of the ancestral home of the O’Kellys and forms a stage of the Beara-Breifne Way which is based on the historic march of O’Sullivan Beara in 1603.